Little Penelope had her eight week jabs yesterday and so was in need of quite a bit of quiet, mummy time to ease her through. Especially having only just gotten over the viral meningitis she picked up in her first few weeks! Enter the mummy hogging toddler tornado! Also, formally known as Theon (her big brother). He just wants to love her and hug her and squeeeeeeze her tight, like really tight, around the neck and make her play with lego. I think you get the picture. So, how the hell do you manage to meet the needs of two under two? For me it’s home made play dough for the win, every time. *Repeat until you have a nice selection of colours. Once made wrap in cling film and store in the fridge to pull out when ever you need just enough distraction time to finish your cuppa! If it helps this batch lasted a week, with me storing it in the fridge between play! Omg I really need to make these!! Tell me about it, it’s playdough or Elmo in our house! 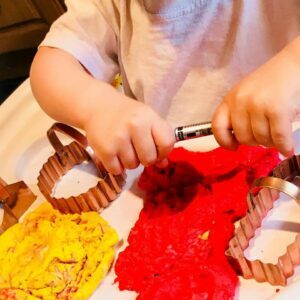 I used to love PlayDoh when I was little – I’ve heard about the DIY recipes too so thanks for the info – I’ll be passing it on.